I broke down this process to 7 steps and I’ll explain every one basing on according WiP photos. I assumed that you know some basic, but if you’ll have some questions feel free to ask. First step is about base coating. 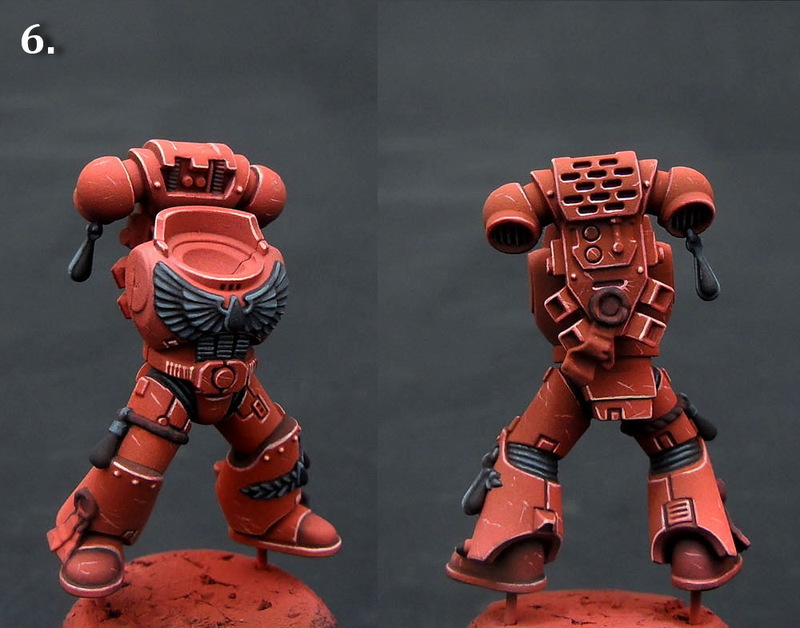 The best way to do this is to use airbrush, especially working with red colours. It’s really ungrateful colour to paint it with brush. I made base coat with Napoleonic Red (Andera Paints) and few highlights with mix of Napoleonic Red and White. At this point whole miniature can look a little pinkish. 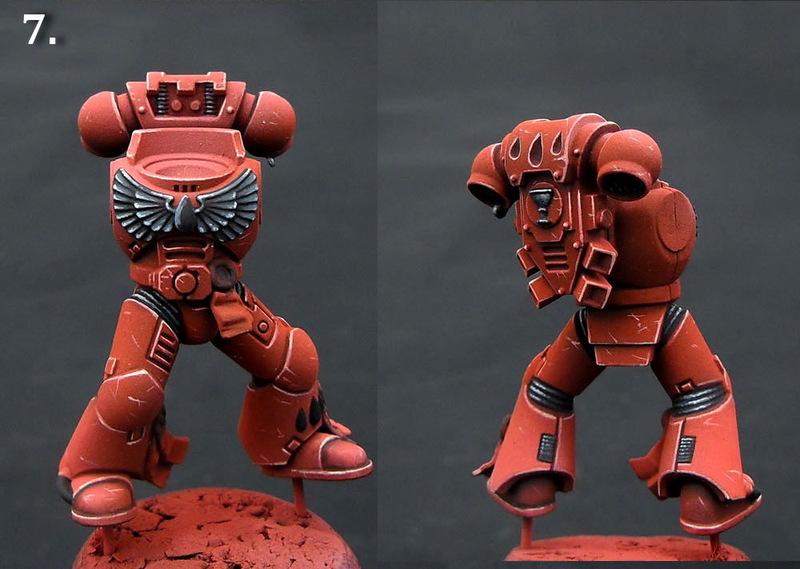 Easy way to overcome this is to make all necessary highlight a little brighter than intended and at the end just add one coat of diluted base red colour. It will make miniature look more red than pink without losing desired highlights. 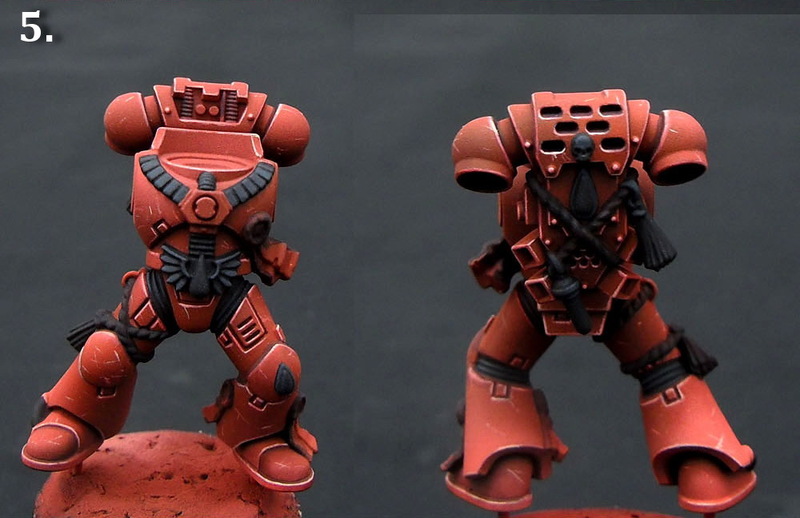 Second step is to make shading ad highlights on the edges. Second thing are highlights. Don’t try to make everything at once. You’ll net at least two layer to make edges look neat. Edge highlight should be as thin as possible. When it’s possible paint with edge of your brush. Of course not every part is easily accessible. Sometimes you’ll need to be just patient and careful. First layer should be you base red mixed with white and second just white. Okay, you already have nice armour but it’s too nice and shiny. Time to make some scratches! First of all use thin brush, size 0 is usually enough. Although if it’s more comfortable for you use even thinner ones. Hard thing in this step is to maintain just right paint consistency. It can’t be too much diluted as well as too thick. You can practice on paper if you don’t feel confident with it. Every scratch should be brighter than base colour. Don’t use only one tone. Another base coating phase. This time only with brush and only for black details. Use only black paint. Be precise and add enough water to you paint. 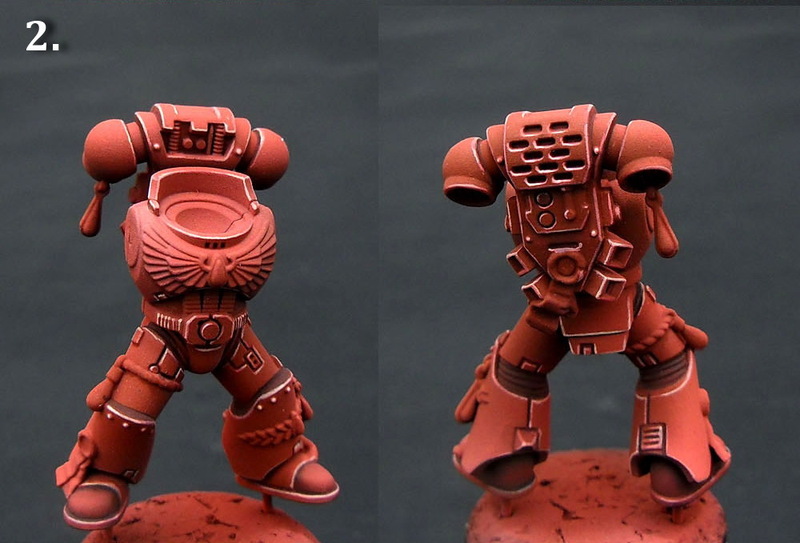 If any part miss black lining at this point it’s good idea to paint it at this phase. 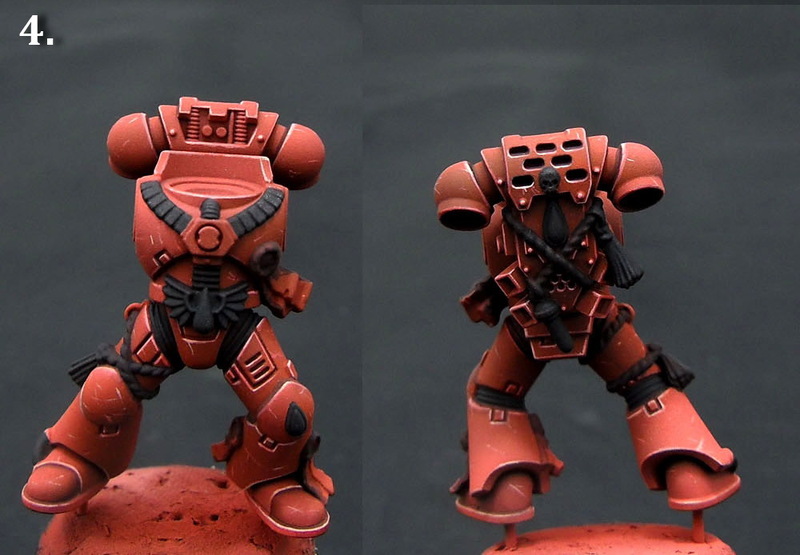 Last thing to do is to highlight all those black elements you just base coated. You’ll need proper mix to start this process. Take you black base paint mix it with a little bit of white and add some blue or turquoise. Add white to your original mix and paint another layer of highlights. Paint the tiniest final highlights on all black elements. 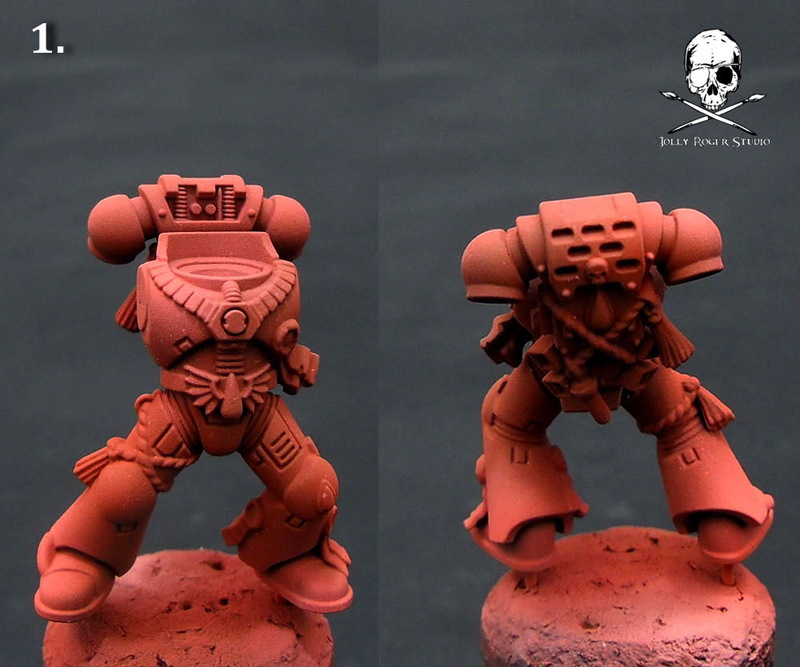 Your power armour is done. The end! 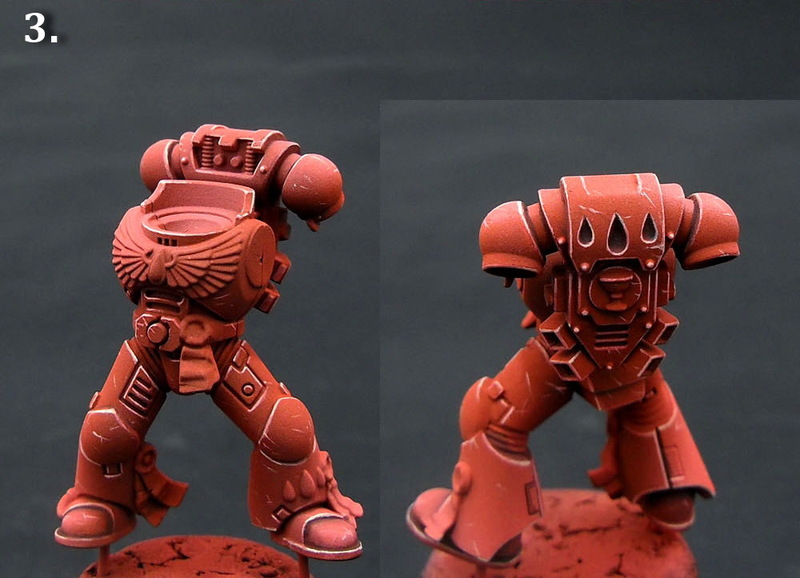 I hope it help you with your own Blood Angels. Please let me know what you think.